Viking Cruises has announced a new agreement with Fincantieri that could see the delivery of six additional ocean ships by 2027. The new understanding expands Viking's partnership with Fincantieri, raising the company's total ocean ship order and options to 16 – the highest-ever for a shipyard from a single owner. The agreement for the six additional ships, which will be delivered in 2024, 2025, 2026 and 2027, is subject to specific conditions. "When we launched our first ocean ship in 2015, we set out to reinvent ocean cruising. We focus on the destination, and we do not cram our ships with gimmicks and waterslides. Our understated, elegant, award-winning ships are designed to simply enable our guests to better explore their destination," said Torstein Hagen, Chairman of Viking. "In our first two years of operation, we have been named the #1 Ocean Cruise Line, and this new order speaks to the positive response we have received from our guests and the industry. As we continue to expand our brand, we look forward to bringing guests to more destinations around the world and introducing them to the Viking way of exploration," Torstein added. Classified by Cruise Critic as "small ships," Viking's all-veranda ocean ships have a gross tonnage of 47,800 tons, have 465 staterooms and host 930 guests. 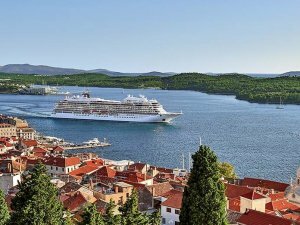 Viking Sun is the newest addition to Viking's award-winning ocean fleet, which also includes Viking Star, Viking Sea and Viking Sky. Viking will welcome two more sister ships in the next two years, including Viking Orion in June 2018. With the arrival of Viking Jupiter in 2019, Viking will be the largest small ship ocean cruise line. Ten additional ships are now on order for delivery starting in 2021, which will bring Viking's ocean fleet to 16 ships by 2027.